The New 52 run of the Flash is one of my favorite comics of the reboot. The series touches on all of the Flash’s villains, something other successful runs such as Batman I feel have failed to do. We see the entire Rouges Gallary as well as the Reverse Flash and King Grood. For a new fan coming in off of watching the finale of the show I enjoyed a totally different spin on Barry Allens world. While the Reverse Flash was not able to capture the same magic as Dr. Wells in season one personally, it was still a fascinating arc. The time traveling King Grood and his army provided the biggest challenge to the Scarlet Speedster with attempts to kill him while devouring his powers in order to save their civilization from the prophecy. It was fun to watch the Rouges and The Flash team up for the better of the city even if it was short lived. Barry Allen faces plenty of turmoil outsider of the suit as well whether it being his sacrifices in his love life or the acceptance of his father’s fate as well as the past. Both in disguise and uncloaked the readers are left entranced by the twists and turns in Barry’s life. His indecisiveness with Patty is intriguing because it poses a real internal conflict. I have always been fascinated with comics who focus on the struggle with balancing the superhero life as well as the everyday life, and this series does it justice. All in all an amazing series so far and one definitely worth checking out if you are a DC fan. 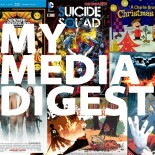 This entry was posted on June 2, 2015 by My Media Digest in Comics, Denzel Freeman, Reviews and tagged Barry allen, Denzel Freeman, new 52, The flash.